POLL: Which Clan should be the main Clan? Hello! Welcome to ShadowClan, my friend. I am Tinystar, the leader of the Clan, and a lucky one at that. The leader before me, Sleetstar, might not have been the most agreeable cat, but he left for StarClan after striking out peace with the other Clans. However, the elders caution me that it will not last, and I agree. Peace can only last for so long before tensions grow and claws unsheathe. For now, though, there is no bloodshed and a tentative peace - which I invite you to enjoy, as well, if you wish. Welcome to the RP! I'm going to be messing with the standard Warriors RP setup a bit, which I hope no one minds and everyone enjoys! I feel like other RPs focus a lot on prophecies and Chosen Cats, and not a lot on including everyone. So I've decided to have all the characters belong to one of the four Clans (Clan TBD - it will depend on the outcome of the poll.) I myself will only control Tinystar in the Clan, but I will also control all outside animals and forces, including the cats of the other Clans. Hopefully this doesn't seem too crazy. I just feel like I never see enough interaction within a Clan, you know? I will eventually throw in some story, I just don't want it to be the focus right away. A Full Grocery List of Terrible Horrible "Rules"
-All PFQ rules apply. I will bump the thread if needed, don't worry. -Violence/romance must be kept below PG15 levels. -If you have triggers and you're worried they'll show up in the RP, I'd like to know. I want to make sure everyone is comfortable with the RP. -If a character is going to die, clear it with all parties involved first. -If you're going away for a while, make sure to inform everyone. -If possible, no AVOS spoilers. This RP takes place in an AU where everything after The Last Hope never happened. -Only basic knowledge of the books is needed. -No limit on number of cats per RPer, but keep it within reason. -No clearly unnatural fur colors or markings. -No spiritual cat names, and no cats named after objects cats don't know. -Try and make your cats Clan-neutral if we haven't chosen a Clan yet. If you want to change your cat to better fit afterwards, it's allowed, just make sure to inform me. -LGBT+ characters are absolutely allowed, go wild with them. -Don't become mates with your own characters. -If you want to pursue a romance with a cat outside the main Clan, please inform me, as I'll be controlling that cat. -Don't demand the deputy position. You can indicate if a cat wants to be deputy, but the final decision is mine, and demanding the role is a no-no. -All PFQ rules apply. Yes, all of them. Including double posting, unless it's vitally important; let me bump the threads, please. 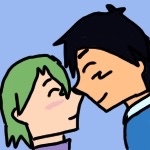 -This also means violence/romance scenes; I don't want this to become a PG15 RP if I can help it. They're allowed, but nothing drastic, please. -If you plan on killing a character off, make sure you clear it with all parties involved first, including me. If you want to keep it a secret plot twist we can discuss it by PM, but I need confirmation that everyone involved is okay with it first. -If you have triggers that you're worried will show up in the RP, please tell me. If you're not comfortable stating them in your public post, you can PM me and I'll try to mention trigger warnings somewhere, but I want to make sure that everyone is comfortable RPing here. -After the RP starts, if you, the roleplayer, are going to be away for a while on vacation/studying/whatever, please say so in the Setup. If you don't want to doublepost, feel free to PM me and I'll announce it. -No AVOS spoilers, if you can? This happens in an AU where any events after The Last Hope never happened, mostly because I've been away from Warriors for a while and have plans to read AVOS, but haven't yet. -Only basic knowledge of the books is needed! This takes place far after the canon timeline, so you don't need knowledge of any canon events. They'll probably only be mentioned as elders' tales, anyway. -Keep your number of characters within reason. There's no limit, but remember that you'll need to keep track of and RP them all. -No clearly unnatural fur colors or markings. A blue-gray tom with white splashes on his face is fine, but a blue tom with a "star-shaped" mark on his face is not. -In the same vein, no cats named after human objects that the cats wouldn't know about. Names used in the books like Tiger-, Apple- and Rye- are fine, but names like Hammer-, Eclipse- and Iron- are not. I am also banning StarClan-related names, notably Spirit- and Star-. -Before the Clan is chosen, I'd recommend trying to make your cats as Clan-neutral as possible. However, if WindClan is chosen and you want to remake your clearly-RiverClan Troutpaw to better fit WindClan, go ahead! Just make sure to inform me. -LGBT+ characters are not only allowed, but encouraged! Go wild with it! -Don't become mates/crushes with your own characters. It defeats the entire purpose of the RP. -That being said, if you want to be friends with a cat in another Clan, or (wiggles eyebrows) pursue a romance with a cat outside the Clan, feel free to tell me! It's a part of Clan life, after all. -Don't ask for the deputy position. You can say on the form, "I'd be willing to have this cat be deputy!" or something, but I will make the decision myself in the RP. Demanding the position will make it less likely that I'll choose you. Character name: Your character's current name. Gender: Whatever gender your character identifies as! Age: I don't need an exact moon count; something like "Senior warrior" or "Older apprentice" or "Young queen" can work! (If your cat's role is not clearly marked by their name, this a good place to say so. -Kit and -Paw are obvious enough as being kits and apprentices, but if your cat has a warrior name they'll default to being a warrior.) Personality: Make this count. In a text-based RP, personality matters much more than appearance, so give as much info as you can, and make sure to give your character flaws as well! History/Family: There needs to be something here, even if it's "Just a normal Clan life." If they have dead family members and you list them here, they might appear as a member of StarClan one day! Appearance: Feel free to make this as detailed or simple as you wish. Images are fine, but you need to be allowed to use them. Other: Just anything that doesn't fit into the other categories. If you want your cat to be able to be chosen for the deputy position, this is the place to say it. If you're open to taking on apprentices, this is also a good spot to say so. Character name: Tinystar Gender: Aro/Ace she-cat Age: Middle-to-Senior warrior age. Personality: An open-minded she-cat, Tinystar remains proud and dedicated to her Clan, although she sometimes needs to be reminded that she needs to take care of her own Clan first, and not all of them. She can get easily offended if someone mentions her size, which helped fuel her determination to be a great warrior ever since she was a kit. Although she knows she'll never have kits herself, she enjoys visiting the nursery to check on the young cats of the Clan, and enjoys helping out the mentors with their lessons. She enjoys hunting over fighting, but she is perfectly willing to unsheathe her claws to protect others, as all Clan leaders must do. History/Family: Her mother Flowermist was killed in a badger attack when she was an apprentice. Tinystar, once Tinylight, used the grief of her loss to fuel her to be the best warrior she could be, and Sleetstar recognized her wish to protect her Clan when he made her his deputy. Her father Acornfur lived long enough to retire peacefully to the life of an elder, but died recently of old age. Appearance: Much smaller than the average cat of her Clan, Tinystar is a light brown tabby with a white chest, front legs and tail-tip. She has a pink nose, and her eyes are pale green. Other: If you want one of your cats to be one of her siblings, go ahead! Other than that, (shrugs) there ain't much else to say here. Character name: Sleetstar Gender: Male Age: Elder (at death) Personality: Sleetstar was independent to a fault and often had to have reason slapped into him. However, he was fiercely loyal to his Clan and, in the end, was willing to sacrifice his pride for peace. History/Family: The majority of his family now resides in StarClan. He chose Tinylight as his deputy because she balanced out his stubbornness with her reason. Appearance: A pale gray tabby tom with amber eyes. Other: If anyone wants to create characters who were his kits, go ahead. The full RP is here. (Feel free to call me Gamer, Game, or whatever you feel fits.) Avatar art created by me. Leader Tinystar (Gamecrown442) - A light brown tabby she-cat with white splashes on her chest and face, and green eyes. She's quite a bit smaller than the average warrior. Deputy The previous deputy, Adderfur, died of sickness this morning. Tinystar is preparing to choose a new deputy at moonhigh. Medicine Cat - Apprentice: Littlepaw Warriors Raggedlight (Dingo Blue) - A massive, fluffy green-eyed tortoishell tom with short legs and huge paws. Shiverjump (Dingo Blue) - A massive, snowy white tom with distinctive black markings and amber eyes. Apprentice: Widepaw Fartail (EccentricWolf) - A lanky brown-and-white she-cat with a long, feathery tail and amber eyes. Cloudcall (EccentricWolf)- A big fluffy mute tortoiseshell-and-white tom with dark eyes. Amberlight (EccentricWolf) - A thick-furred white she-cat with ginger tabby splashes and green eyes. Apprentice: Spiderpaw Dizzyflight (milove) - A thin-furred white she-cat with light brown splotches and coppery eyes. 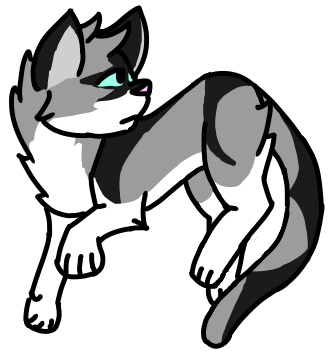 Frostfern (WolfOfProphecys) - A graceful pale gray she-cat with darker paws and blue eyes. Shadestripe (Alliek2008) - A dark gray she-cat with a pale belly and green eyes. Smokecloud (EmeraldSands315) - A brown-gray tabby tom with a tan belly and green eyes. Iciclewing (xKITTUx) - A gray and white she-cat with yellow eyes. Apprentice: Dewpaw Mintfrost (EmeraldSands315) - A small, thick-furred dark brown tom with green eyes. Apprentices Silentpaw (Dingo Blue) - A lean white and silver tabby she-cat with dark markings and blue eyes. Littlepaw (WolfOfProphecys) - A very small brown-furred she-cat with green eyes and a twisted rear right leg. Spiderpaw (CHIHIIRO) - A dark gray she-cat with black markings and amber eyes. Widepaw (EccentricWolf) - An incredibly heavyset tortoiseshell-and-white tom with wide, anxious green eyes. Dewpaw (Alliek2008) - A white-furred tom with bright amber eyes. Queens and Kits Frostleaf (Merri-Marvel) - A fluffy white-furred she-cat with green eyes. -Copperkit (Dingo Blue) - A ginger tabby tom with white rings around his eyes. -Shinekit (Merri-Marvel) - A ginger tabby she-cat with a white belly and socks and blue eyes. -Snowkit (WolfOfProphecys) - A tiny white-furred she-cat with green eyes. Flurryshade (Dingo Blue) - A muscular, mottled gray-and-white she-cat with a bushy tail and sharp amber eyes. Elders Fishleap (Dingo Blue) - A heavily graying silver tabby tom, with failing, clouded blue eyes. Goldenfur (Alliek2008) - A golden-furred tabby she-cat with green eyes. Ashstorm (WolfOfProphecys) - A small gray-furred she-cat with ginger flecks down her spine and blind green eyes. Echo (xKITTUx) - A white-dappled tortoiseshell tom kittypet with amber eyes. Icy - A very pale gray tom; rogue. Sunflower - A ginger-and-white tabby she-cat who lives at the Horseplace. Bandit - A black-and-white tom who lives at the Horseplace. Sebastian - A white tom with brown tabby splashes who lives at the Horseplace. Leader Spottedstar - A broad-shouldered tortoiseshell-and-white tom. Deputy Barkheart - A mottled dark brown she-cat. Apprentice: Lionpaw - A sturdy golden-brown tom. Medicine Cats Daylily - A long-furred red-brown she-cat. Violetmoon - A skinny gray tom. Warriors Frostwillow - A massive white-furred tom. Blackdawn - A night-black she-cat. Apprentice: Emberpaw - A bright ginger she-cat. Larchclaw - A dark brown tabby tom with a light front left leg. Apprentice: Pinepaw - A very dark brown tom. Rattail - A lanky tortoiseshell tom. Antfall - A small tortoiseshell tom. Nettlefrost - A dark gray she-cat. Jayshade - A small, mottled gray tom. Iceheart - A very pale gray tabby tom. Apprentice: Nightpaw - A black-furred she-cat. Blueshell - A large, blue-gray tabby tom. Waspwing - A bright ginger tabby she-cat. Apprentice: Hollypaw - A very dark brown tabby she-cat. Lightningnose - A dark ginger tabby tom. Queen and Kits Birdfeather - A graceful light brown tabby she-cat. Currently nursing Songkit (brown tabby tom), Brightkit (pale tortoiseshell tom), and Robinkit (tortoiseshell-and-white she-cat). Elders Darkclaw - A dark gray tom with darker flecks. Shelleye - A thick-furred gray tabby tom. Sandfang - A long-legged pale ginger she-cat. Leader Boulderstar - A massive, broad-shouldered pale gray tom. Deputy Foxwing - A large, bright ginger she-cat. Medicine Cat Poppyleaf - A small dark brown tabby she-cat. Warriors Brambletail - A dark brown tabby tom with a long tail. 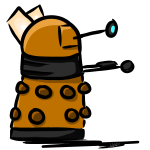 Apprentice: Cloverpaw - A golden-brown tom. Heavyfall - A heavyset ginger tabby tom. Lightshine - A graceful pale ginger she-cat. Ashflower - A dappled gray she-cat. Snowfoot - A small, very pale gray she-cat. Apprentice: Dustpaw - A light brown tabby tom. Beetlespring - A large black-furred tom. Apprentice: Marshpaw - A skinny dark brown she-cat. Stormscar - A dark gray tom with prominent scarring across his face and nose. Coppernose - A bright red-ginger tom. Apprentice: Spiderpaw - A dark gray-and-white tom. Frogshine - A small dark brown tabby tom. Queen Wildrose - A small pale gray tabby she-cat. Elders Morningmist - A long-furred golden-brown tabby she-cat. Pinknose - A black-and-white tom with a distinctly pink nose. Leader Goldenstar - A lithe golden-brown tom with silver starting to speckle his muzzle. Deputy Wrenwillow - A lanky mousy-brown tom. (Currently covering for Falconwing, who is nursing kits.) Medicine Cat Mudfrost - A skinny dark brown tom. Warriors Flashfoot - A small tortoiseshell-and-white she-cat. Rabbitflight - A lanky tortoiseshell tom. Apprentice: Hailpaw - A pale gray tabby she-cat. Leopardbreeze - A dark gray-and-white she-cat. 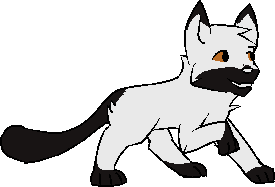 Apprentice: Skypaw - A pale gray-and-white tom. Patchlight - A lanky dark gray tom with lighter markings on his face. Russetmist - A red-brown tabby she-cat. Apprentice: Hawkpaw - A long-legged light brown tabby tom. Silverfoot - A long-legged pale gray tom. Hollowbrook - A long-furred brown tabby tom. Apprentice: Whitepaw - A white-furred tom with black flecks down his spine. Snakenose - A dark brown tabby tom. Sparrowbright - A mottled pale gray tom. Queen and Kits Falconwing - A mottled gray-and-white she-cat. Currently nursing Rosekit (A black-and-white she-cat), Flintkit (A dark gray tom), Cloudkit (A gray-and-white tabby she-cat) and Mistkit (A gray-furred she-cat). Elder Shinepool - A small, golden-brown tabby tom. Character name: Raggedlight Gender: Male Age: Senior Warrior Personality: Raggedlight is full of wisdom and advice, and will pass this on to apprentices who don't even ask for it. He has endless patience, it would seem, and enjoys entertaining kits. As big and scary as he is, he is very kind and gentle even to outsiders. He's a bit of a goofy cat and has a deep appreciation for jokes and the like. History/Family: Born to clan parents, Raggedlight is Shiverjump's littermate, and Silentpaw's older brother. He was often teased for his huge size, his short legs making him unusually clumsy. As a kit, he and Shiverjump quickly outgrew the nursery and so were allowed to participate in more domestice apprentice duties during their final moon, moon and a half of kithood. This was mostly changing bedding, helping fix dens, the usual camp duties, though of course they weren't allowed out of camp :p Raggedlight was slow to get the hang of hunting, his short legs unable to launch his body far enough, but he quickly earned the title of 'best fighting apprentice' among his denmates. The heavyset tom could deliver stronger blows than most others, figuring out how to put as much of his weight behind his paw as he could. His favourite battle move is to ram his head into an opponent's chest and essentially 'flip' them over/topple them. Appearance: Inaccurate pixel A massive, extremely fluffy tortoiseshell with short legs and huge paws. Other: Tesseri-Shira/Nova Nocturne made the base for Raggedlight and Shiverjump's pixels. If Tinystar thinks Raggedlight would make a good deputy, that's fine by me. Character name: Silentpaw Gender: Female Age: Senior apprentice/young warrior Personality: Silentpaw is friendly and chatty to all no matter where they come from. She has very intense emotions, and is extremely protective over her family, even though an apprentice can't really do much. At times she seems very detached from the real world, and she seems to bounce in and out of different levels of attentiveness - one day she might perfectly perform a move, and the next day she might completely screw it up. A natural runner, Silentpaw is practically obsessed with becoming the fastest apprentice in the clan. She does seem quite insecure about her abilities though, and is worried about failure and letting her mentor down. History/Family: The younger sister of Raggedlight and Shiverjump, her parents died from battle related causes not long after she became an apprentice. She was never really close to them, even as a kit, and was not affected too deeply by their deaths - they died fighting for their clan, what death could be more noble? Her mentor always had their work cut out for them, as Silentpaw has always swayed from picking things up quickly to being completely unable to do anything. Her rebellious tendencies as a kit were never grown out of, and even now she sneaks away to do her own things. Appearance: I did this one too :D A lean bodied white and silver tabby with dark markings. Other: Her mentor would need patience and should be quite stern with her. She's failed to pass her warrior assessment and has not performed in any major cross clan battles or anything to warrant being promoted to warrior. To put a vague number on her age, she's at least a year and a half old. Accepted! They'll be added to allegiances when I'm not on mobile. Character name: Foxfire Gender: Female Age: About twenty seasons. (Sixty moons or so.) 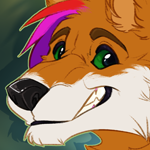 Personality: Foxfire doesn't hesitate when it comes to things. If she's in a conflicting situation, she seems to instinctively know which choice to pick. She's ferocious in battle, and kind with her Clanmates. She seems to have left her more instinct-based decisions behind with the rest of her apprenticeship. History/Family: Foxfire doesn't have much to speak of about any history, as she had a normal kithood. Her parents both sadly perished in battle, but she understands that such is the way of the wild. Appearance: Foxfire is a bright, reddish-orange color. Her paws are pale white, and her tailtip shares that same property. Her bright green eyes offset her fur. Other: She has ambitions to become deputy, but has not brought up the topic in any way since Adderfur's passing. She is grieving deeply, yet is hiding the fact that she is quite shaken by his death. Accepted! Once again, I'll add them to allegiances as soon as I'm off mobile because editing coding on mobile is a terrible curse Considering the state of the poll so far, I'm probably going to start building the other Clans sometime soon, starting from our current least popular choice. I haven't done a Warriors RP (or any RP, really) in years. This seems fun. Character name: Smokecloud Gender: Male Age: A fairy young warrior, around twenty moons. Personality: Brave to a point that borders on recklessness, a little arrogant, and always eager to prove himself. He has a stubborn streak a mile wide and can be hotheaded at times, but he's a good cat at heart. History/Family: Nothing out of the ordinary. Appearance: Brownish-gray tabby with a tan underbelly and green eyes. Other: He's bi with a preference for toms. He's also trans. Character name: Mintfrost Gender: Male Age: Fourteen moons; only recently became a warrior. Personality: Very shy, gentle, and softspoken. He's mostly a pacifist, but tries his best to defend his clan. He gets along well with kits, though he doesn't wish to have any of his own. History/Family: Nothing out of the ordinary. Appearance: On the small side with thick, dark brown fur, white chest and paws, and green eyes. Other: He's asexual, biromantic with a slight preference for she-cats, and trans.